It’s been some time since my last Inspiring Words post, but it’s been one whirlwind of a month. Too busy to really dedicate myself to my usual posts in the midst of work, planning some upcoming events and dessert orders. Emotionally I’ve been going through a few obstacles for quite some time now, and a year of these emotions finally came crashing together last month. There’s so much I want to share with you about my experiences, what I’ve learned and how I finally came into the light, but that post will come sometime this week or next. I’ve completed this monthlong mediation experience to manifesting true success, and I honestly am finally getting back to the true Diana all thanks to Deepak and Oprah. Seriously, I highly recommend taking part in this mediation experience, even if you’re not quite committed to daily mediation practices or think it’s not for you, just listen to these recordings on your way to work or when you’re folding laundry, I promise the words will change something within you. 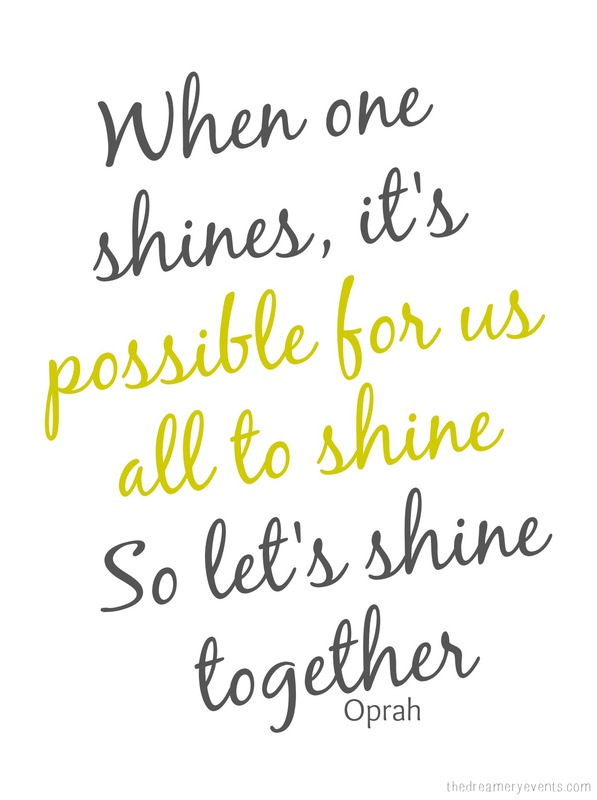 Of all the quotes that moved me, which are plenty, these spoken by Oprah on one of my last mediations, about shining not just as an individual but all together, stuck with me. We can not truly manifest success or much of anything else, if we only try to better ourselves and make our inner light shine. We must do and wish the same upon everyone else. We are all working within the same Universe, when we help others bring light and happiness into their lives, before our own, we in turn call upon those same actions and positivity into our own life. So, let’s all help another have a happy and beautiful week!